Another game...another first-inning hole...another come-from-behind win. 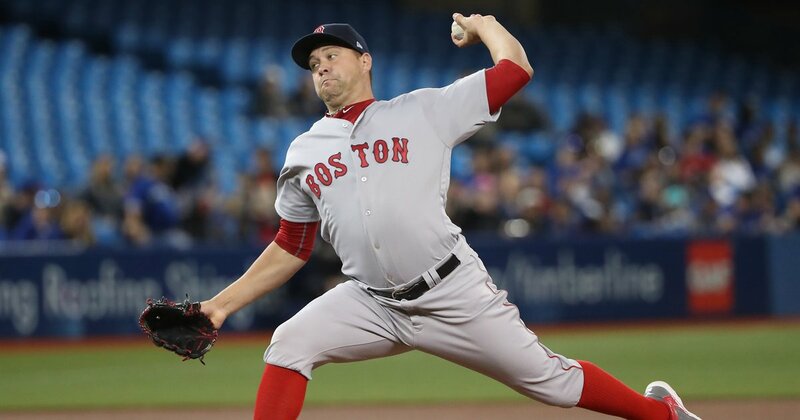 The Red Sox rallied from 2-0 down with three runs in the top of the fourth inning and three more in the fifth, en route to an 8-7 win over the Blue Jays at Rogers Centre. Brian Johnson (pictured) made his first start of the season for Boston, going five innings for the win. He allowed four runs on seven hits. He struck out six and walked three. Mookie Betts and Mitch Moreland each had three hits for the Red Sox. Moreland collected his tenth double of the year; Betts ripped his first home run of 2017. Heath Hembree and Fernando Abad combined for 2.2 scoreless innings before giving way to Matt Barnes who survived a three-run Toronto ninth inning. Betts extended his consecutive at-bat streak without striking out. His last K came on September 12, 2016.